LioniX International has set a world record by manufacturing and characterizing the world’s first fully integrated optical beamforming network (iOBFN). This chip-based module is built around the hybrid Indium Phosphide-TriPleX platform which combines chip-based modulators, lasers and detectors with the low-loss silicon nitride waveguide technology where further signal processing, such as filtering, phase shifting and group delay is performed. To our knowledge, this is the first fully integrated microwave photonic module that provides full RF-to-RF functionality and combines 4 RF-signal inputs to 1 combined RF output. These modules will be used in beamforming modules for broadband satellite communication at Ka band (19 GHz), and are an essential step towards development for future 5G mmWave wireless applications at even higher frequencies (28 GHz and 60 GHz). They provide outdoor and indoor wireless coverage and capacity to end users and enable real time HD video, gaming and communication. 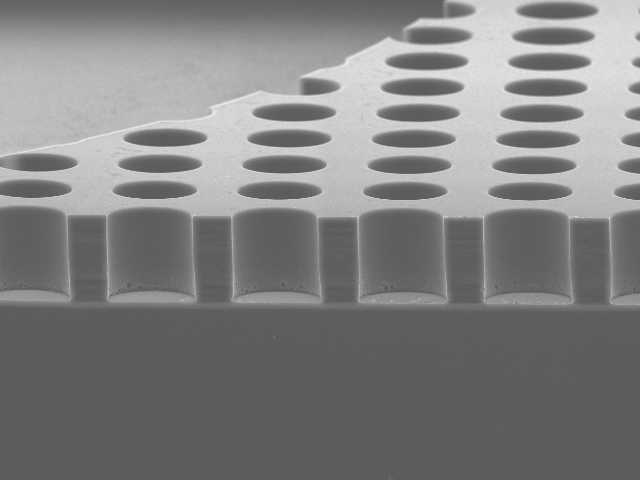 Tuesday, July 10, 2018: PHIX Photonics assembly (PHIX) moves forward in the next step of its growth due to the recent acquisition of LioniX International BV by Magic Micro Co. Ltd . As part of this acquisition and the further implementation plan towards high volume assembly of Photonic Integrated Circuit (PIC) modules, LioniX International has increased its share in PHIX. This will strengthen its position as a vertical integrated supplier of PIC based modules. In parallel to this change in ownership, PHIX also secures financial support for the upscaling from semi- automated to fully-automated assembly lines. Both Magic Micro and Panthera International (the original main shareholder of LioniX International) are committing to financially support PHIX for further upscaling. This growth is needed to serve current customers and market demands. ‘This participation will enable us to serve our worldwide customers for moving from prototyping to high volume manufacturing of PIC based modules’, said Hans van den Vlekkert, CEO of LioniX International. Details of the financial support are not disclosed. PHIX supplies the photonics industry with assembly and packaging services for Photonics Integrated Circuits. The photonics industry is one of fastest growing industries at moment and can be compared with the electronics industry of the 70’s during the introduction of the ICs. In photonic integration there are three main technology platforms and each has its preferred application areas. Silicon, InP, and TriPleX. Combining these different platforms by hybrid integration even enhances the possible application of photonic integration into the fast growing markets like tele- and data-communication, life science, automotive and consumer electronics. The main challenge for combining the PIC platforms is in the hybrid integration of the various PICs in one package. Not only have the PICs to be connected to optical fibers and electrical connections but also they have to be interconnected. This is the main focus of PHIX: to supply PIC manufacturers for assembly of their PICs and package them into qualified modules for their OEM customers. Magic Micro Co. Ltd is a manufacturer of Display LED, Lighting LED and vehicle LED on the basis of innovative and creative technologies. The company has self-core technologies as “Spot Plating” and established “All in House system” in the whole process by cost, production and technology competitiveness. For customer satisfaction, Magic Micro provides quick map based CRM (Customer Relationship Manager) customer service. On 19 June a new assembly machine was presented by the Fraunhofer Project Center. This machine will allow large-scale photonic chip production to become a reality in Twente. The machine has been developed in collaboration with PHIX Photonics Assembly, an international innovator in the field of assembly and packaging services for the photonics industry. Read the press release about this high-precision machine. For our customized MEMS, LioniX International offers flexibility in design as well as in process. We are prepared to leave the standard processing routes and develop customized process variations and combinations to achieve manufacturable solutions meeting your specification requirements. If you are interested in what we can do please have a look at this site. Or join us at the Hilton Head Workshop on Solid-State Sensors, Actuators and Microsystems. June 3 – 7, 2018.